Need a unique and tasty appetizer? 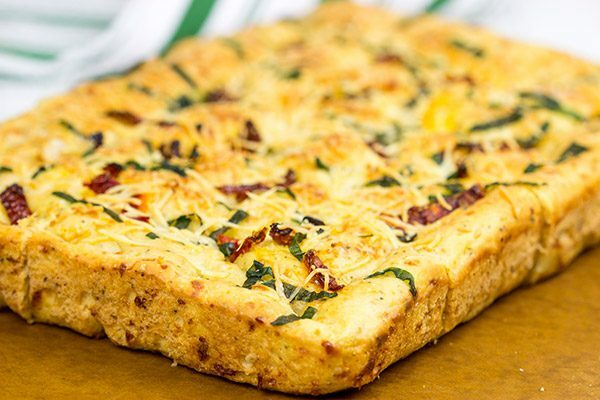 Give this Cheesy Spinach and Sundried Tomato Focaccia a try! I stumbled across the most amazing stat the other day. The world’s largest focaccia bread was baked in Taranto, Italy back in 2005…and it weighed 6,172 pounds (2,800 kg). 6,000 pounds. I searched for photos as I imagine this focaccia must have taken up the entire piazza in Taranto. No luck on the photos, but I’d venture to guess that they might still be eating that focaccia. 6,000 pounds! 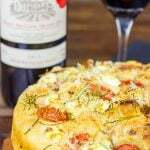 Have you ever baked focaccia at home? I’ve baked it a number of times now, but the first few times were epic fails. Like I’m kinda surprised I stuck with it after seeing how poorly the first few turned out. The first time was probably 5 years ago, and I wanted to take a freshly baked focaccia as an appetizer to our neighborhood holiday party. I must have misread the recipe because this focaccia was literally swimming in olive oil. It absorbed as much as it possible while baking, and it still had a lot of olive oil left in the pan. Oops. Epic fail #2 happened a couple years back when I was visiting one of my buddies down in Philly. He loves focaccia. But he didn’t know much about baking. I love baking bread, so I suggested we make a batch of focaccia one afternoon. We were just sitting around watching football with our wives, so it was the perfect time to make a delicious snack. Well, I’m thinking we misread the pan size because we ended up with something more like focaccia crackers. Still tasty, but definitely not focaccia. Oops. Not to be deterred, I stuck with the focaccia experiments, and I’ve finally got a couple good focaccia recipes. There was this Goat Cheese and Tomato Focaccia a few months back, and now this Cheesy Spinach and Sundried Tomato Focaccia. The shredded mozz in the dough trick is a good one, and this might become my go-to focaccia base now. I know some folks out there have an aversion to yeast. I get it. Yeast is a different beast (no pun intended). But if yeast is still scary to you, then this is about as safe of a yeasted recipe as you’ll find. You mix up the dough, press it into a pan and let it rest for about 1 1/2 hours at room temperature. It’s pretty hard to screw this one up! Before baking, I tossed some fresh spinach and sundried tomatoes on top of the dough, and the result was magical. Our house smelled incredible while this bread was baking! This Cheesy Spinach and Sundried Tomato Focaccia was tasty enough to just gobble down by itself, but if there are leftovers (hah…leftovers), then they would make some pretty epic sandwich bread. I might have to make another batch soon just to save for sandwich bread. Enjoy! Lightly grease a 9”x13” baking pan; brush 1 Tbsp of olive oil into bottom of pan. 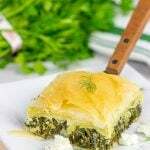 Combine the remaining 3 Tbsp of olive oil with all of the other dough ingredients in a large bowl; beat vigorously (by hand) or on high speed (electric mixer) for 1-2 minutes or until all ingredients are well-combined. Brush dough lightly with 1 Tbsp of olive oil. Sprinkle top of dough with garlic, salt, spinach, tomatoes and Parmesan cheese. Bake at 375°F for 35-38 minutes, or until focaccia is golden brown on top. Cut into squares and serve, or split and use for sandwiches. Looks like a delicious focaccia, David! 6000 lb focaccia? Whoa! That’s a lot of bread! 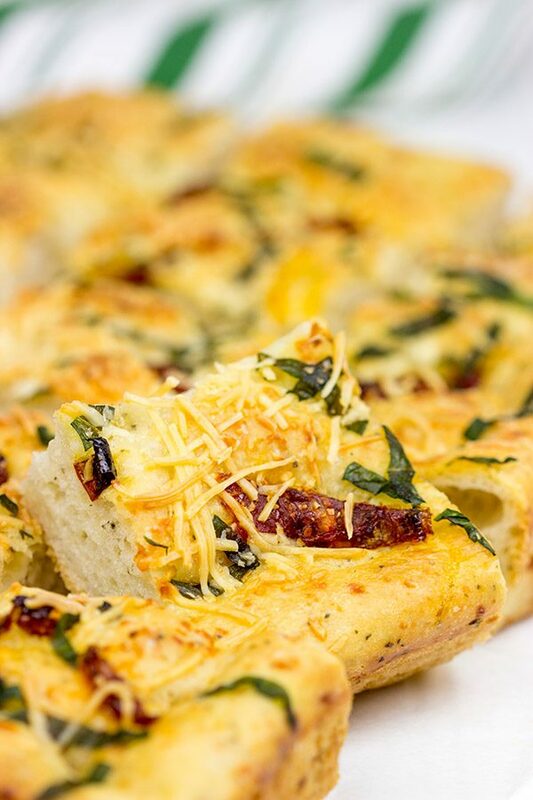 I love using sundried tomatoes on focaccia. First couple of times I did, though, I had the temp too high and burnt them 🙁 So, I ended up picking most of them off. I LOVE using leftovers for sandwiches; it’s the best, isn’t it? Gimme this, some prosciutto and a glass of vino and I’m set. Perfect dinner 🙂 Pinning for later! Whoaaaa 6000lb focaccia? I could sleep on it! 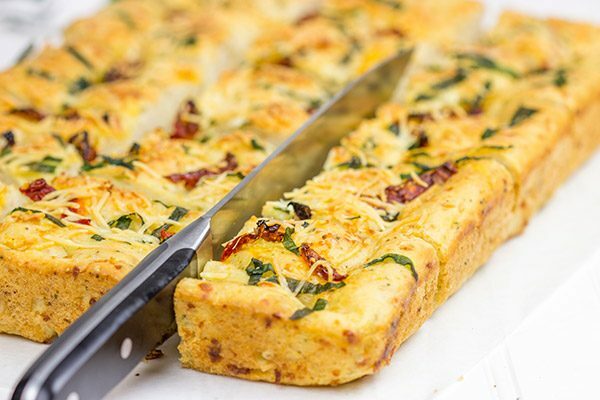 I love how you add spinach and cheese to this focaccia. I bet the combination tastes so delicious. Extra cheese, please! Hahaha…I’ve never thought about sleeping on focaccia, but you’re right, Linda. You could indeed sleep on a 6,000 pound loaf of focaccia bread! And more cheese you say? Done!! Hi David! I bet this didn’t last long with your curling club! I have sun dried tomatoes on hand, but no spinach. However, our asparagus has started coming up and some of what we are getting is really skinny. What do you think about adding it as a topping for this? This loaf didn’t last long at all, Dorothy! Hmmm…asparagus? I think that could work actually. I would just make sure it’s really skinny. My first thought was to shave the asparagus with a peeler, but if the stalks are super skinny then you might be ok as is. If you don’t shave them, I would at least chop the stalks so you don’t end up with a long stalk that is difficult to eat. But yes, I think it would be a great use of that asparagus!! Hi David! These stalks are extremely skinny – I’m talking less than a half of a pencil and, of course, I would chop it up! This bread would make a great salami sandwich! Or to dip in marinara sauce! I agree, pretty hard to mess up focaccia, one of the easiest breads to make and super delicious too! Love this version David! Cheese both in AND on focaccia?! I’m definitely on board with that. I’ve made focaccia twice, once when I had no idea what I was doing in the kitchen, and a second time after I had learned enough to become anxious about baking with yeast. Ironically, the first focaccia turned out way better…it’s like the second one *knew* I was afraid of it. Time to try again? I think yes! Duuude – the texture of this is awesome! 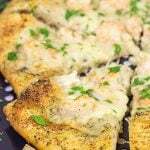 It brings to mind the focaccia I used to nosh on when I was a young ‘un working in a bakery – I’ve never attempted to make my own – but you recovered well from your fails to come up with this EPIC one! Lil Shashi seems to think she is outgoing her gluten issues – she’s been experimenting with a slice of gluten full bread everyday and if she saw this – she might try to get me to talk you into making her a 6000 lb version – heck, while you are at it, you might as well experiment and make it a cheese-STUFFED focaccia! You’ve never attempted to make your own focaccia? Lies I say! Lies! So Lil Shashi is opening up to gluten again? I’m hopeful here! (Seriously…I’m really hopeful!) And yes, a cheese stuffed focaccia might need to happen next. Can you imagine how awesome that would be?? Oh please, I know you’ve made some recipes multiple times, Ben. I read your blog! You are a perfectionist like me…except you love lavender! Pine nuts would be an excellent addition on top of this focaccia. Good thinking! I should start running all of my ideas by you as you’ve always got great twists. And in return? You get a 5 pound pulled pork sandwich. But you have to eat it all in one sitting. That’s the deal, ok? Thank you so much, Medha! 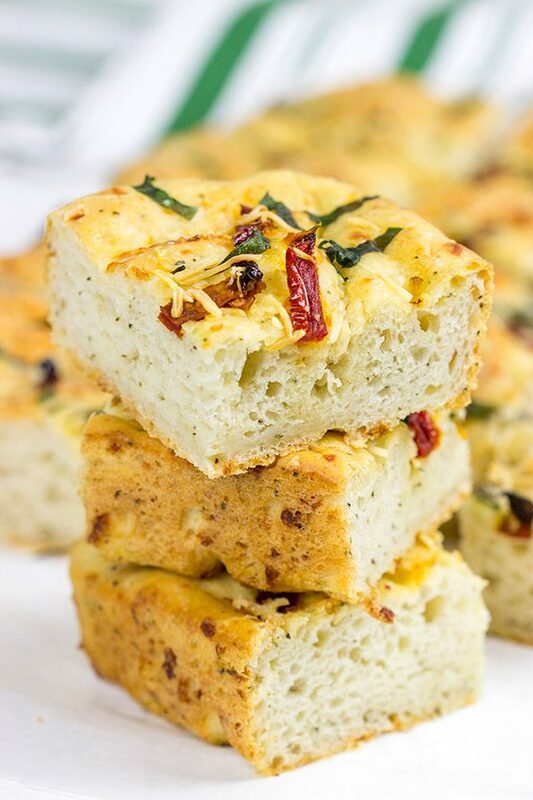 I love a good focaccia…so easy to make, too! Love the idea of baking it throughout instead of stuffing- You get a cheesy bite each time! The colossal one though…geebuz that would have been a sight! I wish I was in your curling club…not to curl but to eat. Can you even imagine that 6,000 pound gorilla…uh, I mean focaccia…in the room? You should come up for next curling season. I could use the help eating all the foods. Haha! That was one insane sized focaccia – 6,000 pounds? Would love ot see a picture! That cheese in the dough tip is a great one! Loved reading your mishaps and that focaccia cracker one is too funny. Probably not at the time, because you were ready to mack down on the real deal, but funny nonetheless. I know, right, Kevin? I searched for a photo, but I couldn’t find anything. It’s the first (and probably last) time that the web has failed me. Maybe we should recreate that 6,000 pound focaccia so that we can get a photo? I’m thinking we’ll need a wide-angle lens, right? I love focaccia. but 6000 pounds is even more than I could eat! 🙂 I love that you’ve added sundried tomatoes! They add so much flavor. This looks amazing! 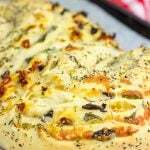 I love homemade focaccia – one of my favourite things! Your version looks fantastic, I have never added cheese to my focaccia. What a good idea! Yeah, I stumbled across the shredded cheese in the focaccia trick somewhere. At first I thought it was a little strange, but it’s totally a good trick! The cheese kinda disappears as it bakes, but the flavor is all there. Totally worth trying it next time you bake focaccia, Miriam! I love making bread. I grew up in a house where there always homemade bread. I have only make focaccia once, but I have to make it again. Yours looks delicious.I love the spinach and sun dried tomatoes on this one. Also, cheese is always a good thing to add to bread, I think the mozzarella goes well with this focaccia. 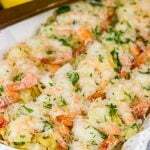 Great recipe- great pictures!! Wow, that is a big bit of bread! Imagine the sandwich that you could make from that. I am all over this, as anything with sundried tomatoes has to be a good thing, right? Wow! A 6000 pound focaccia is quite impressive! I can’t even imagine what that looks like! I’m glad you stuck with your desire to make it yourself after two fails because this combo looks perfect! You can’t go wrong with adding cheese in my book. 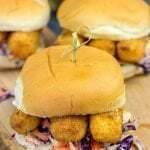 I totally want to make this and stuff it with meatballs for the most amazing sandwich ever! I totally agree, Rachelle…I’d love to just see a 6,000 pound focaccia. And then I’d love to do my part in eating a 6,000 pound focaccia. 🙂 Oh, now I just want a meatball sandwich on focaccia…and I just ate lunch! Maybe that’s why I couldn’t find a picture of that darned 6,000 pound loaf, Beverley…they’re still too busy eating it! 🙂 Give this focaccia a shot. It’s really, really good! 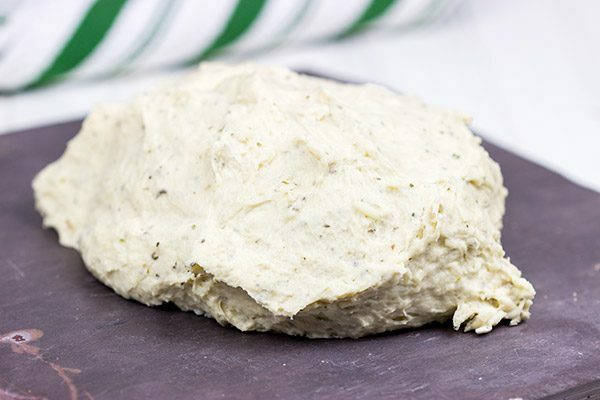 omg – i cant wait to try this David..
we love making bread at home… this one seems delicious ! This sounds like an awesome appetizer idea for when I have guests over! I love focaccia but have never made it myself… actually, it’s been awhile since I’ve eaten it all. Now that you’ve got it on my brain, I might need to make this soon! You are definitely right, Nicole…this would make a great recipe to have when friends are over. We made a batch when our friends were visiting, and I made another batch at the same time to take over to our new neighbors. 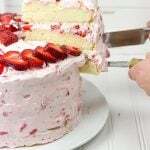 Nice and easy recipe…and it’s crazy delicious! Hope that foot of yours is feeling better! 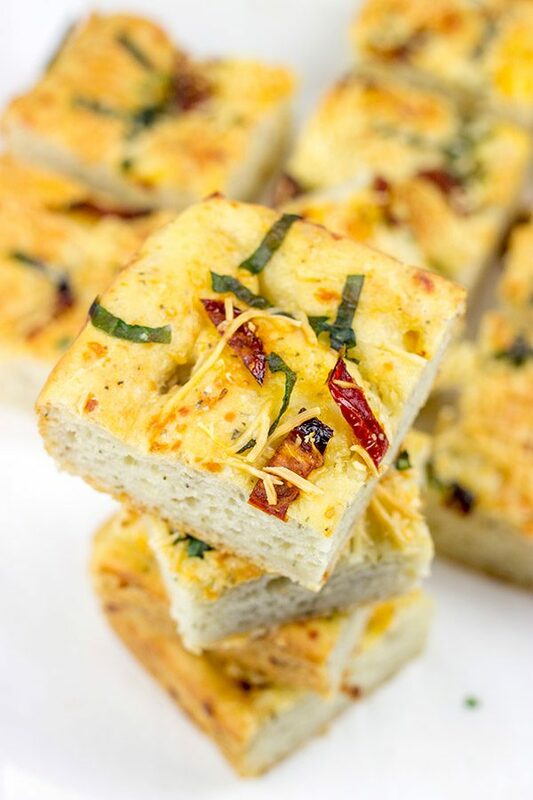 Focaccia bread totally has it’s own fan club, Priya…and I’m a member! 🙂 Next time I make this focaccia, I can grab some more photos for a tutorial…but it is a seriously easy recipe. All you do is mix the ingredients, press them into a baking dish, add toppings and let dough rise. Then toss it in the oven and it’s all done. I know you can make this one! A 6000 lb. focaccia is perfect! Finally, I can gorge myself on it, while not worrying that I’m neglecting my manners (since they’ll almost certainly be enough to share … almost certainly).